Hmmmmmm. Kind of goes hand in hand, don't you think? I wanted to paint this unique Harvest Moon at a very special location. Spring Island immediately came to mind. It's a 3000 acre nature preserve and residential community in the heart of the SC low country. The above scene is the view from the 18th fairway. Rob and I were wondering if the clouds were going to break open enough to view the moon's rise. It was a lovely evening. 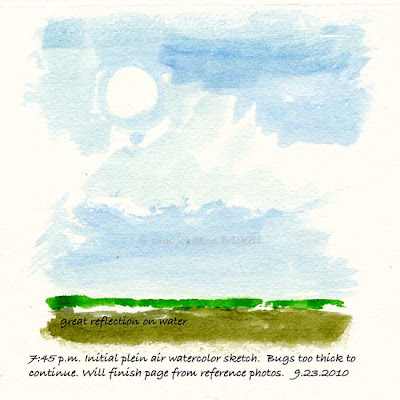 The long shadows were sliding over the marsh grass. A sailboat was out on the Chechessee River heading toward Port Royal Sound. Clouds were turning this amazing shade of orange! And, flocks and flocks of White Ibis and quite a few Wood Storks flew over, heading to the Island's rookery. As sunsets do, all the colors in the sky disappeared and boom, the Harvest Moon in all its glory peeked out! There were soooo many clouds moving quickly that I decided to do three vignettes - all in 8 minutes! I love it when Rob is with me on these outings. He's the photographer in the family. RIT graduate with a photo science degree - and he still remembers all the technical stuff! Oh, to have half of his memory capacity :) At first, he felt a tad encumbered with my totally automatic camera. He'd much rather have his larger SLR and big lens, set on manual no less! He made it work and I've got some great reference shots to finish these sketches with. I first learned this year's Harvest Moon and Autumnal Equinox were to coincide a couple of weeks ago. Wow! How special and what a treat for my Full Moon Series! Here are links to some very interesting information. 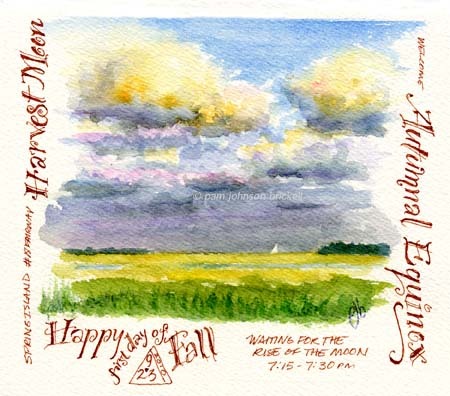 • Astronomer Ed Murphy from UVa discusses the Autumanl Equinox and how leap days came into being. I am really enjoying following this series. 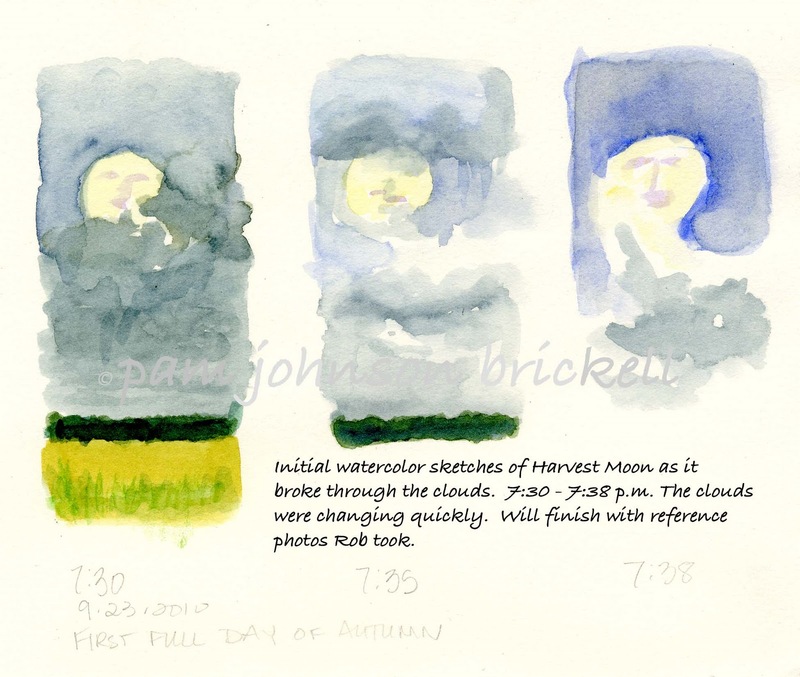 This Harvest Moon painting is exceptional. I love all of the color that you've captured in the clouds - awesome. I love the moon sketches. You went to a lot of trouble to get them.